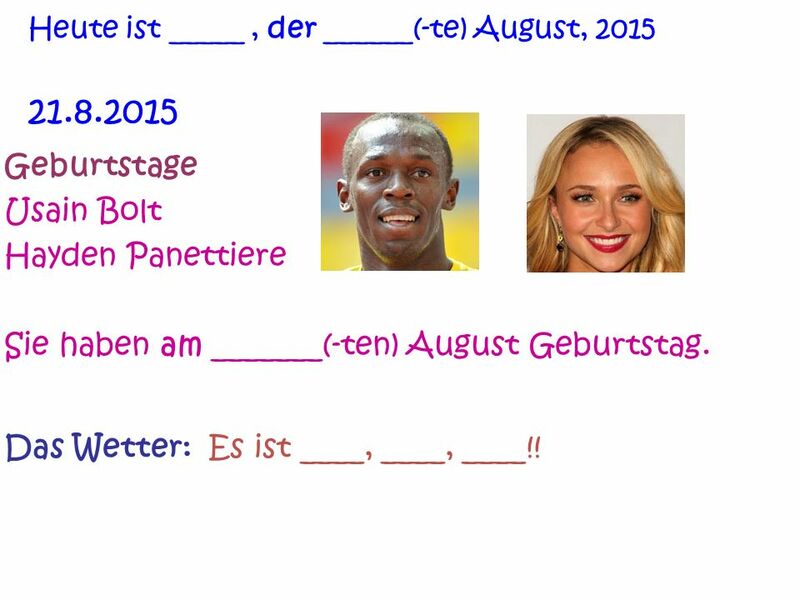 1 Jetzt Machen 1.Turn in your Fragebogen on the table at the back of the classroom if you have not yet done so. 2.Grab one of each document on the back table and keep them accessible. (2. 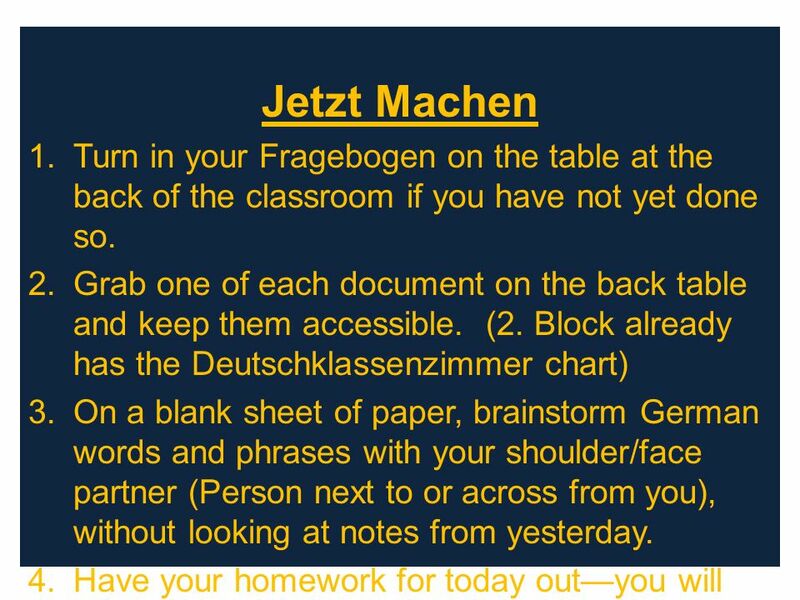 Block already has the Deutschklassenzimmer chart) 3.On a blank sheet of paper, brainstorm German words and phrases with your shoulder/face partner (Person next to or across from you), without looking at notes from yesterday. 4.Have your homework for today out—you will need it for the next activity. 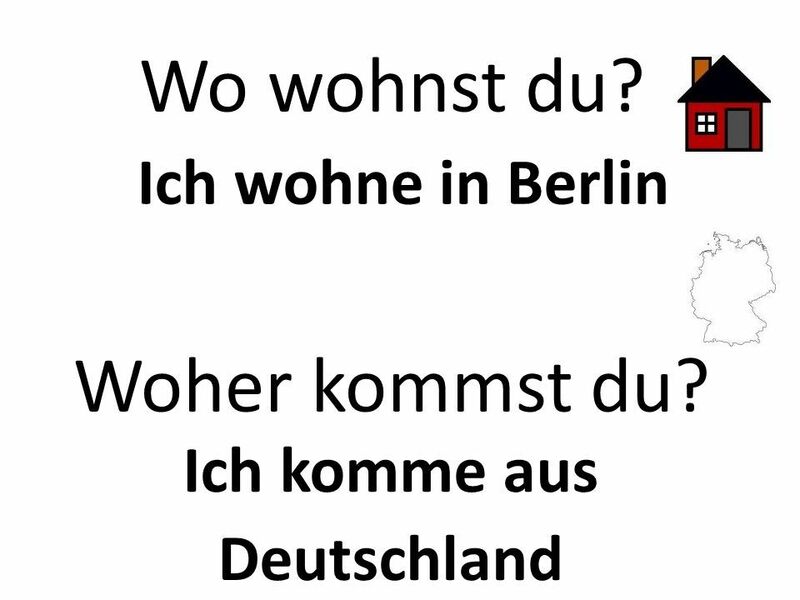 7 Im Deutschunterricht Wie stellst du dir das vor? How do you see the upcoming year going? 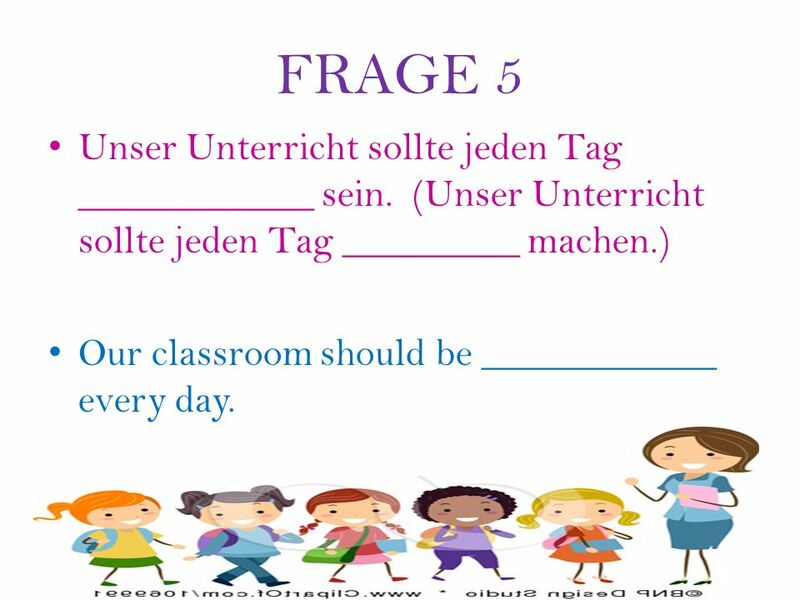 8 FRAGE 1 Was sollen die anderen Schüler machen, um sicher zu machen, dass wir einen tollen Unterricht haben? What should students in our class be doing to make sure our class runs as smooth as possible? 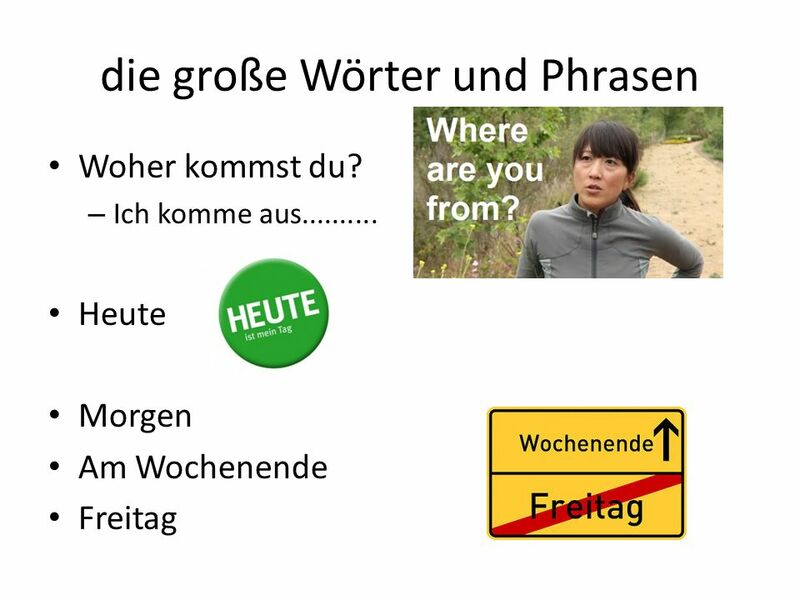 9 FRAGE 2 Was hoffst du dieses Jahr im Deutschunterricht zu lernen? 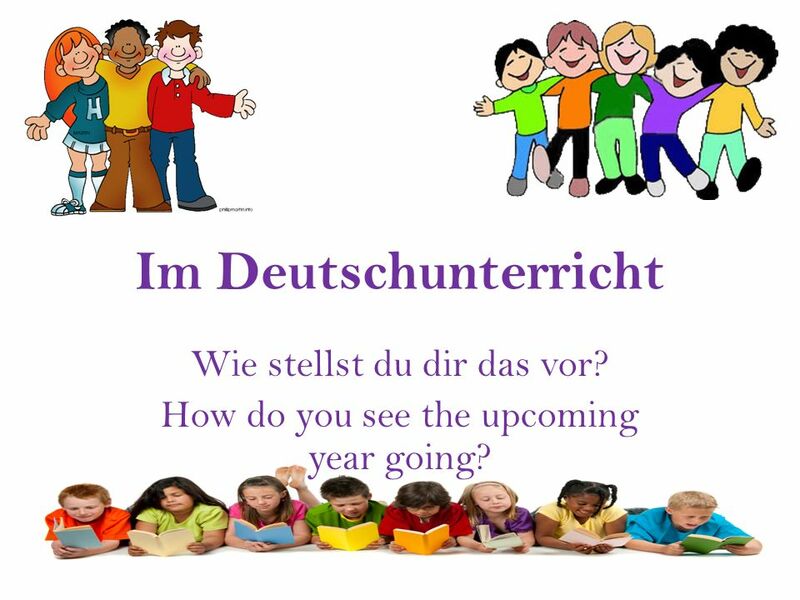 What do you hope to learn this year in German class? 10 FRAGE 3 Was wirst du machen müssen, um dieses Jahr erfolgreich zu sein? What will you need to do in order to be successful this year? 11 FRAGE 4 Was kann Frau Ehnle machen, um dir dieses Jahr zu helfen? Was wäre hilfreich? 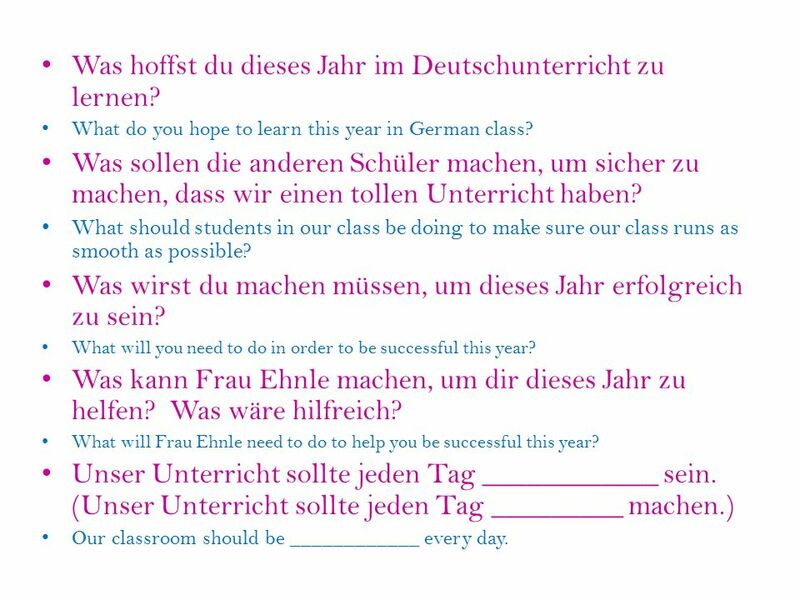 What will Frau Ehnle need to do to help you be successful this year? 12 FRAGE 5 Unser Unterricht sollte jeden Tag ____________ sein. (Unser Unterricht sollte jeden Tag _________ machen.) Our classroom should be ____________ every day. 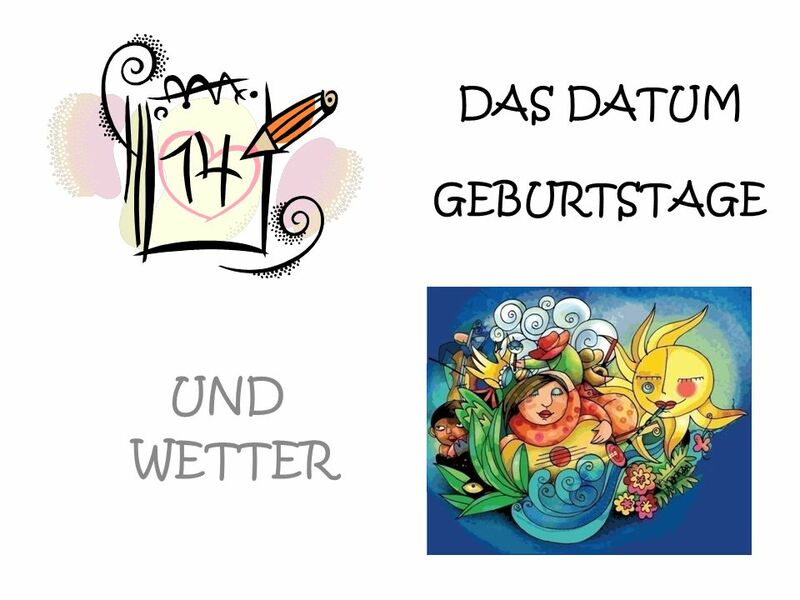 13 Was hoffst du dieses Jahr im Deutschunterricht zu lernen? 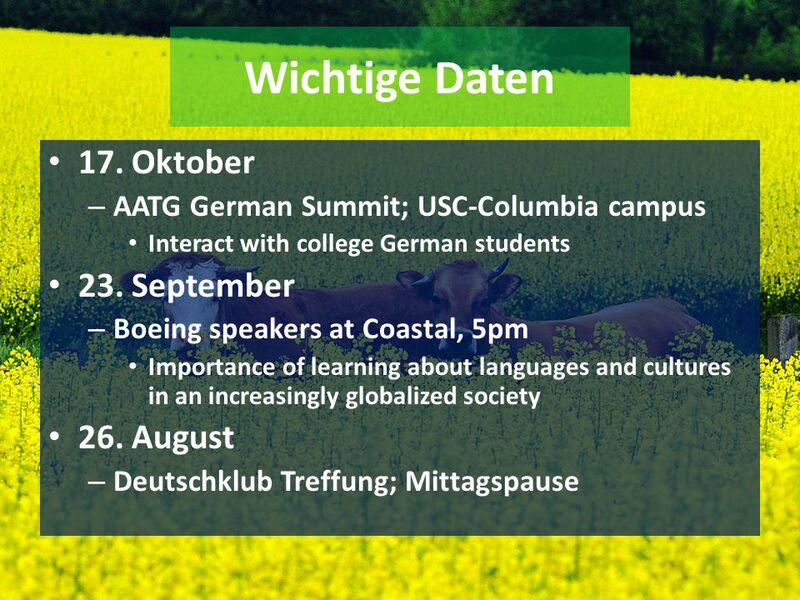 What do you hope to learn this year in German class? Was sollen die anderen Schüler machen, um sicher zu machen, dass wir einen tollen Unterricht haben? What should students in our class be doing to make sure our class runs as smooth as possible? Was wirst du machen müssen, um dieses Jahr erfolgreich zu sein? What will you need to do in order to be successful this year? Was kann Frau Ehnle machen, um dir dieses Jahr zu helfen? Was wäre hilfreich? 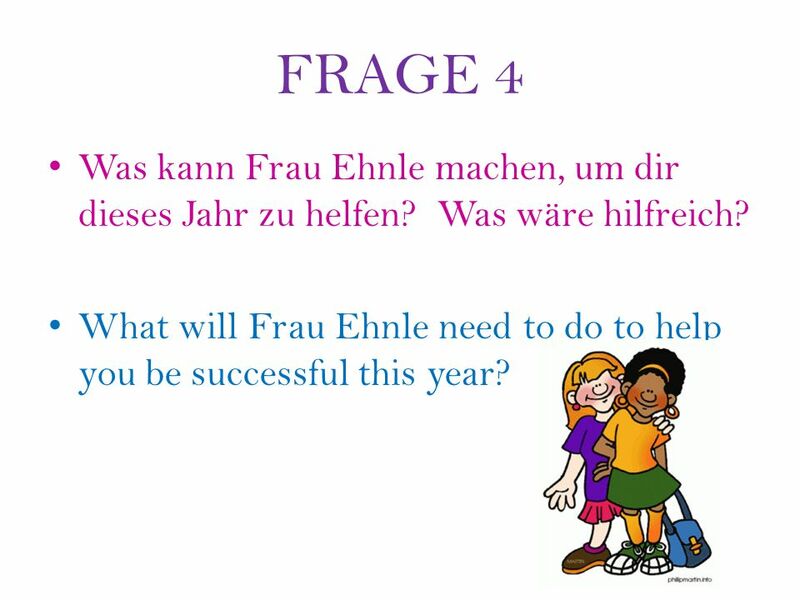 What will Frau Ehnle need to do to help you be successful this year? Unser Unterricht sollte jeden Tag ____________ sein. (Unser Unterricht sollte jeden Tag _________ machen.) Our classroom should be ____________ every day. Herunterladen ppt "Jetzt Machen 1.Turn in your Fragebogen on the table at the back of the classroom if you have not yet done so. 2.Grab one of each document on the back table."